That’s why there’s so much advice about it. Websites, communities, courses, masterminds. 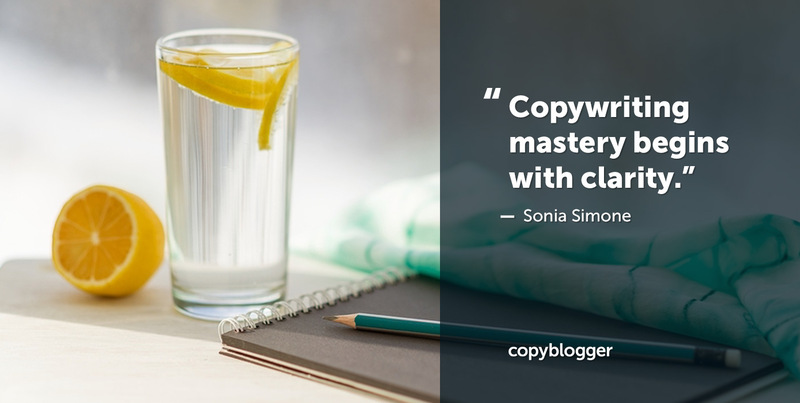 If you’ve built an audience, taught them a bunch of stuff, and maybe even attracted some loyal fans, but you still don’t have a business … it’s probably because you’re expecting content to do the work of copywriting. If you don’t have enough sign-ups for your email list, the answer is copy. If you don’t have enough sales for your ebook or course, the answer is copy. If you don’t have enough clients for your business, the answer is copy. If you don’t have enough volunteers for your nonprofit, or voters for your political cause, the answer is copy. And if you’ve been running ads but you still aren’t making money … yep, you still have a copy problem. The internet is full of people telling you about the latest Ninja Rockstar Gangster Money-Getting Tactical System. Here’s a genuinely weird secret I’ve learned: A lot of those actually work. But trying to apply Ninja stuff when you still don’t have a grasp of basic copywriting is like dumping a bunch of frosting on a plate before you know how to bake the cake. No matter how delicious that frosting might be, it’s still going to give your guests indigestion. Instead of chasing the latest system, consider taking a deep breath and finding clarity. I’ll repeat her three points of clarity that must be in place before anything good can happen. Your piece contains all the key information required to deliver on the promise. If you aren’t clear on these yet, you probably still have some listening to do. If you’ve been clear on them in the past, but you aren’t today … you probably still have some listening to do. Because we don’t get to know and deeply understand our audiences once, then coast for the rest of our lives on that knowledge. Relationships need ongoing care and attention. You’ll keep striving for deeper clarity for as long as you’re publishing content and copy. Once you really understand these humans who have been paying attention to your blog posts, your social media accounts, your videos, or your podcasts, you can start thinking about creating their state change. About moving those humans from Point A to Point B. About crafting transparent, ethical communication that lets them see the next step on the path. Not a crazy-advanced ultra next-level persuasion system. But focused, clear, and respectful communication with a persuasive intent. Hey … guess who’s finally launching a copywriting course? We’ve had folks asking us for years to put a copywriting course together. Truth be told, until now, our calendar has always been too insane overwhelming psychotic full to create that course. And there are other good copywriting courses out there. But a smart writer doesn’t join just one persuasive copywriting course, any more than a smart baker owns just one cookbook. What we haven’t seen (yet) is a solid copywriting course specifically designed for content creators. That helps us make the most of our gifts, as well as overcoming some common constraints. That reframes some of the mindset weirdness many content writers have around selling (“Ack! I worked so hard to build this audience relationship, I don’t want to wreck it!”). And that uses the content we’re already working hard on to pave a path to purchase. A copywriting course that’s positioned as a copywriting course??? ?